Full-time mommy and solo-preneur at MomBeyondBaby – helping busy moms lose fat, eat intuitively, and lead a happy and balanced life! As busy moms, time is not on our side. It is very easy to say we have no time to work out, eat healthy and think about us because our plates are filled with taking care of everything and everyone else. But the truth is that if we don’t take care of us then who will? It is so easy to get caught up in doing everything for everyone else but it’s important to remember that we simply cannot be the best mom if we don’t take care of us. It is just not possible. Taking care of you is part of surviving as a mom. How patient can you possibly be if you never get a minute? How good can you feel if you are constantly feeling stuffed in your clothes? How can you keep up with your kids when you feel like you need a nap…all.day.long? Everything I do when it comes to fitness is to be a positive role model for my daughter and to be able to enjoy life. That is always at the forefront of my mind because let’s face it, when the alarm goes off at 5am for a workout, something bigger than weight loss has to be on my mind. If not, hello snooze button! But I have no time. I get that. It is easy to look at our days with everything we have to balance and say we have no time. But so many times moms are not aware that to be healthy and fit, you don’t need a lot of time. Anything is better than nothing. When it comes to health and fitness, sustainable and maintainable are the goals. Can you continue what you are doing 5 years from now? Do you even want to? 1. Invest in a pair of dumbbells. Seriously, every mom should own a few pieces of fitness equipment to use at home, dumbbells being one of the first. You do not need fancy equipment to get fit. You don’t need a gym or machines. You can get a full body workout that is effective for fat loss and time efficient at home. You can often buy used equipment at garage sales or on Craigslist too. 2. Start small. When I say small, I mean start with a few days a week for 10 minutes. If you are just starting out, don’t commit to working out 5 days a week. Throw yourself a bone and allow yourself to feel successful instead of over committing and then feeling like a failure. Once that becomes something you can fit in without stressing, move to 20 minutes. When we start small, we win. And once we win, we start to see how great we feel when we do take a few minutes to take care of us. 3. Something is better than nothing. Seriously. Working out does not mean you have to have a perfect routine all the time. 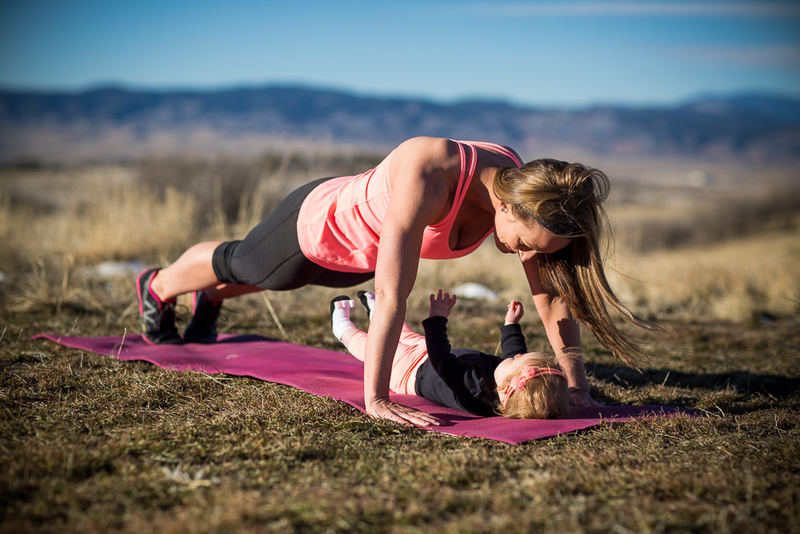 When it comes to being a healthy and fit mom, just move. You can move with your kids, take a walk with the stroller, or even do a one minute sizzler where you perform an exercise for one minute (think burpees, push ups, squats). It does not need to be complicated. 4. Enjoy family fitness. Make it a priority to be active with your kids and your family. Set aside one or two weekend days or weeknights to engage in something “fun” and play as a family. Hiking, swimming, bike rides and even a game of tag at the playground are among my favorites. As a busy mom it is easy to just say “I have no time.” Taking care of you is hard. It may require planning and it may feel like one more thing to add to your list at the start. But once you get started you will begin to notice just how good you feel. The afternoon energy slumps will be gone, your clothes will fit better, you will have more patience, and your kids will start to notice. They are watching every move. Take care of you!